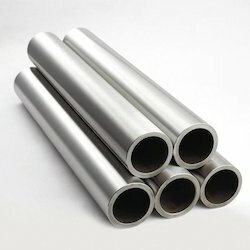 We are a leading Manufacturer of nickel alloys round bar, nickel round bar, nickel alloys pipes and tubes, nickel alloys sheets and steel circles from Mumbai, India. 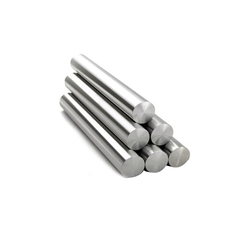 We import high temp Nickel Alloys Round Bar from different countries. Normally available in premium standard Grade 2, our high temp nickel alloys round bar are moderate strength and oxidization resistance, these nickel alloy round bars meet the demands of different industrial clients. Strictly following the research modules of our skilled professional, we are involved in manufacturing and exporting Nickel Round Bar on a large scale. These bars are well polished which has the capacity to face the extreme conditions. Our round bars are more reliable and durable according to the customer choice. We manufacture these bars using high grade raw materials and also undergo various quality tests to ensure its stability. We are engaged in supply and export of a wide range of nickel pipes and tubes, which find application in diverse industries for the purpose of fabrication. These nickel pipes and nickel tubes are made from Nickel 200, which is a 99.6% pure nickel and imparts our tubes excellent mechanical & magnetic properties, high thermal & electrical conductivity, low gas content & vapor- pressure. Our nickel alloy pipes and tubes are available in standard as well as customized lengths, thickness, sizes and dimensions to suit the demands of different industries. Avail from us superior quality Monel pipes and tubes made from Monel 400, which are in wide demand in domestic as well as overseas markets. As monel resists to stress, corrosion & cracking in fresh waters, these monel pipes and tubes are immensely used in the marine industries. Sourced from reliable vendors of the markets, these monel pipes and tubes can be availed as per the specifications and demands of our clients. We offer these pipes in proper packaging to avoid any damage during the transit. We offer a wide array of Inconel 825 Pipes & Tubes, that meet the fabrication demands of varied industries. The Inconel 825, used in these steel Pipes & Tubes resists to different corrosive environments and makes them last for long span of time. Available in all standard and customized sizes, these Pipes & Tubes are most competitively priced. We present a comprehensive range of Hastelloy pipes and tubes, in grades Hastelloy C22 that are used in numbers of industries including marine, chemical processing, power, pollution control, paper and many more. We are a quality oriented organization and hence purchase these Hastelloy pipes and tubes from the the trustworthy manufacturers. Our pipes and tubes are resistant to general corrosion, crevice corrosion, inter granular attack, pitting and stress corrosion cracking. 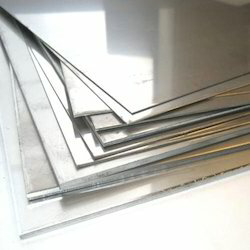 We offer high temp Nickel Alloys Sheets, coils and plates with 2B, 2D, HR, CR, BA. These are available with PVC coated finish in various forms. Nickel Alloys: Monel 400 & 500, Inconel 600 & 625, Incolloy 800, 825, Hastelloy 904, Titanium, Tungsten, Silver Nickel, Zirconium, Palladium, Vanadium etc. Our organization is well known in the market for providing a broad assortment of Steel Circles to our clients. These products are assembled using optimum quality components. These products are widely admired across the market for their optimum performance. Apart from this, one can purchase these products at the reasonable price from us. Additionally, these are widely used in various industrial applications.